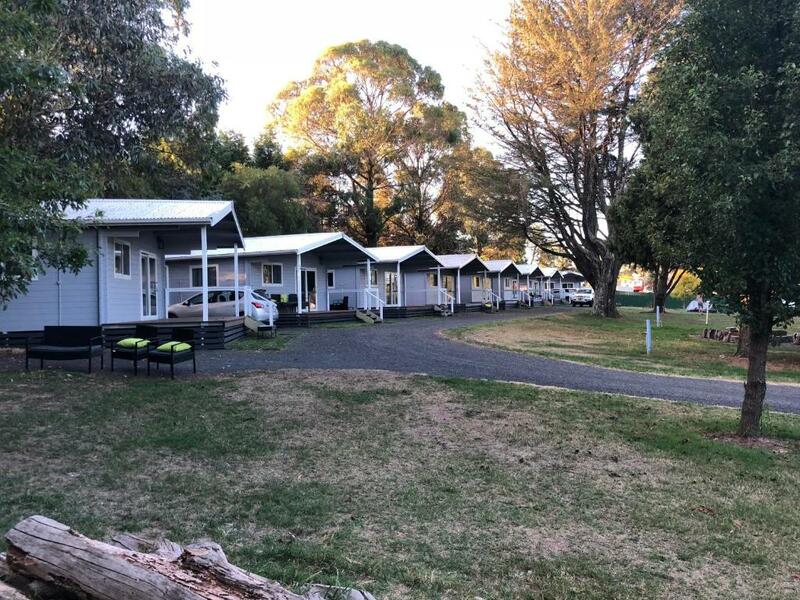 Lock in a great price for Jenolan Caravan Park Oberon – rated 8.6 by recent guests! The young lady behind the counter was very, very nice. The park was very quite, close to the town so we could walk every where we wanted to go. Also the park and the unit was very clean and tidy. A credit to them. Bed was comfortable. Amenities very basic. Tea and coffee making facilities provided but no milk. The bed linen was high quality.Great king size bed. The carpet was clean the cabin was excellent size. The kitchenette perfect size. The air conditioning was quiet. The bathroom had lovely accessories. Far better than any Hotel in Oberon. Beautiful new cabin, brand new aircon and comfortable bed. Beautiful staff, so friendly and worked extra hard to get us in the room early with no notice. Best cabin I've stayed in! The cabin was very new, very clean and very cosy. Perfect for one night. Great spot, super clean and comfortable cabins. Nice and modern not like the dated stuffy places you usually find in country towns. I was really surprised. the staff were helpful and it was great for a quick overnight stay after a wedding. The cabin was great bed was very comfortable. Very clean. 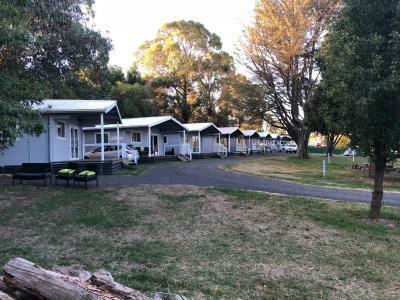 Jenolan Caravan Park Oberon This rating is a reflection of how the property compares to the industry standard when it comes to price, facilities and services available. It's based on a self-evaluation by the property. Use this rating to help choose your stay! Located in Oberon, Jenolan Caravan Park Oberon has accommodations with a flat-screen TV. Some units also have a kitchenette equipped with a microwave, a toaster, and a fridge. Bathurst is 29 miles from Jenolan Holiday Park Oberon, while Jenolan Caves is 18 miles away. When would you like to stay at Jenolan Caravan Park Oberon? This chalet has a balcony, flat-screen TV and stovetop. This chalet features a kitchenette, DVD player and air conditioning. This bungalow has a balcony, sofa and electric kettle. House Rules Jenolan Caravan Park Oberon takes special requests – add in the next step! Jenolan Caravan Park Oberon accepts these cards and reserves the right to temporarily hold an amount prior to arrival. A surcharge of AUD 20 per hour applies for arrivals prior to check-in of 14:00. For more information, please contact the property using the contact details found on the booking form. Please inform Jenolan Caravan Park Oberon of your expected arrival time in advance. You can use the Special Requests box when booking, or contact the property directly using the contact details in your confirmation. Hmmm....a small bottle of milk. Due to my check in time, I was unable to actually check in. There was no milk in the room (I realize this is often given at check in), but I thought it could have been put in the fridge or at the front door? A bit noisy as you would expect in a caravan park. The town didn't have any good coffee. Good location. Nice quiet park. The new delux cabins are amazing, the whole place is very clean and very close to town. The rooms were very tiny. The reception was closed most of the time. Also, the chalet did not have a porch, which was a surprise as all the pictures when booking featured the porch. The location was near the center of town. Local council pool next door with $8 per family entry. Close driving distance to Jenolan caves. Friendly and helpful staff and good amenities.